At this year's 'Münchner GI-Runde' conference and theses awards, Ingrid Schardinger (iSpace) won the top price in the PhD category. Being recognized as the 'Geoinformatics PhD researcher of the year' is a very special achievement - sincere congratulations to Ingrid!! 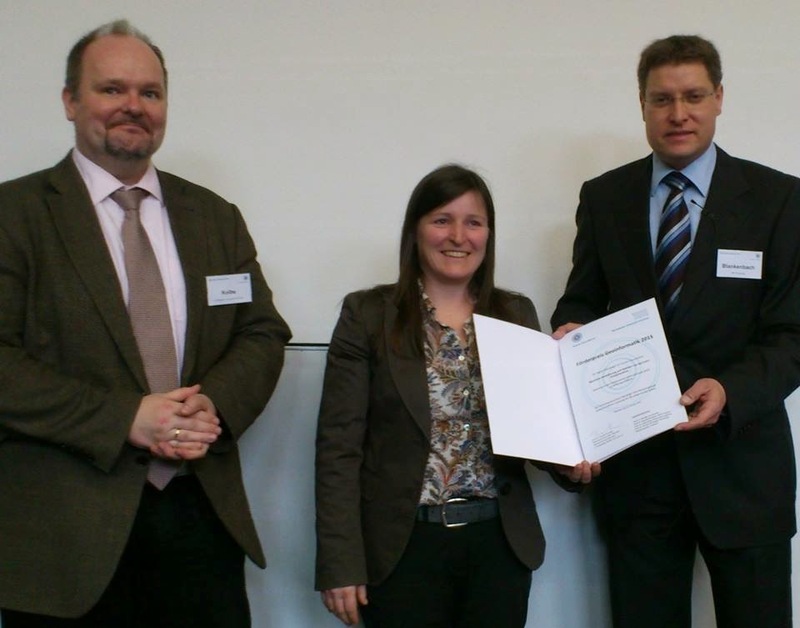 She had successfully defended her thesis on "Räumliche Modellierung und Optimierung regionaler Energiesysteme" ('Spatial modelling and optimization of regional energy systems') at the Interfaculty Department of Geoinformatics - Z_GIS in 2014, supervised by Prof Thomas Blaschke and within the organisational framework of the iSpace Research Studio. With her PhD, she followed up her award-winning MSc work also selected for distinctions above and beyond the University of Salzburg. Z_GIS graduates' success at the 2015 awards was complemented by Christoph Schlacher winning the Master category with his UNIGIS thesis: another outstanding role model for current and future generations of Geoinformatics students! LTER Austria presented and published a new White Paper for long-term ecosystem research in Austria at an international conference in Vienna last week (February 19, 2015). The aim of the White Paper is European networking and concerted financing of environment and ecosystem research to secure a coordinated approach. A research cluster should be implemented to coordinate different activities and facilities and make an important contribution to the European ecosystem-research. The long-term ecosystem research focuses on better understanding and analyzing on ecosystems structures, functions, and long-term responses to climate change, invasive species, substances and human activities. The results of the long-term series of measurement deliver an important source of information for political decision makers. Since 2012 the Interfaculty Department of Geoinformatics is a member of the LTER network contributing to the LTER AT site Mondsee. Since 2014 Z_GIS also coordinates the LTER site Stubacher Sonnblickkees. The Interfaculty Department of Geoinformatics - Z_GIS was invited to conduct a workshop on 'Geoinformatics for Analysis of Human and Land Resources' at the Centre for the Study of Regional Development (CSRD), Jawaharlal Nehru University (JNU), New Delhi, India for enhancing institutional capacity in processing and analysis of advanced Geospatial data. Dr. Shahnawaz (Z_GIS) conducted an intensive workshop from 14th to 16th February, 2015 and trained 22 researchers in processing and analysis of a variety of statistical data, satellite imagery and Digital Elevation Models (DEMs). The participant researchers cross-matched the acquired Geospatial competences with their respective fields of research, expressed high level of satisfaction with their learning outcomes and conveyed gratitude to Z_GIS for the contributions it has made toward 'Geospatial Capacity Building' at the CSRD for more than a decade of institutional cooperation.